The School’s campus is located in the historic East Rock section of New Haven, in close proximity to Yale University and other major educational institutions. We take advantage of nearby renowned cultural and recreational facilities, which serve to extend our educational resources. Our main School building, which won a national award from the American Institute of Architects, houses grades one through six classrooms, science and computer labs, library, and gymnasium. Robbins Hall houses the Kindergarten and art studio. The campus includes two playgrounds and creative outdoor learning spaces. We are adjacent to Edgerton Park which is used for Physical Education classes and yearlong studies. St. Thomas’s offers an Extended Day Care Program for our students designed to meet the child care needs of working parents. Care is available five days a week both before and after regular school hours. Extended Day Care Hours: Early Opening: 7:30-8:15 a.m. Extended Day: 3:00-5:30 p.m. Vacation programs are offered during our winter and spring breaks, and for the week following the end of the school year. There are additional charges for all programs offered outside the hours of the regular school day. The community finds much joy in embracing and celebrating each individual’s uniqueness along the lines of age, gender, religion, ability, socioeconomic status, race, ethnicity, culture and family structure. St. Thomas’s currently serves students from over 20 communities, with the largest representation from Branford, Hamden, New Haven, North Haven, and Woodbridge. Bus transportation is provided by the city of New Haven for New Haven residents. School Placement St. Thomas’s is proud of the reputation it has earned with local secondary schools. Graduates attend Hopkins, Hamden Hall, Foote, Cheshire Academy, public, parochial, and other independent schools, often with academic distinction and in roles of student leadership. Photo Album: Our School at a Glance! 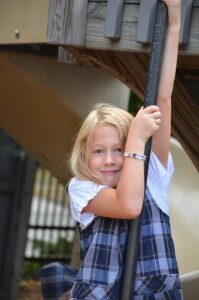 In the fine tradition of Episcopal schools, St. Thomas’s Day School has been educating children, Kindergarten through Grade Six, for more than fifty-eight years. 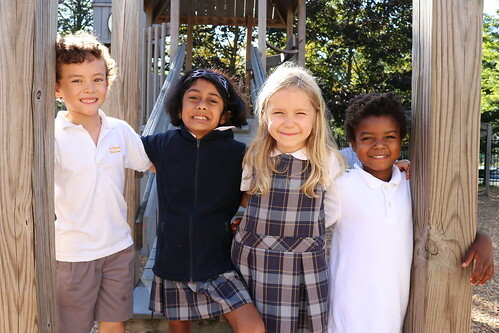 We are a coeducational day school welcoming students from all backgrounds with the belief that children who learn and grow together develop openness and respect for others.